At a time when the Mujahideen have intensified their campaign against the enemy (for example the recent deadly attack against Shaheen Corps in the north killing hundreds of combatants), the regime is gripped by paralyses and anarchy. The politically and ethnically divided regime has thrown all forms of constitutional and political conventions out the window. The line of authority is devolving and blurring with each passing day. Cabinet members openly contradict and oppose government policies and directives. Each group blames the others for the ongoing chaos. The so-called President (Ashraf Ghani) is openly mocked and challenged by the Chief Executive (Abdullah Abdullah). Parliament members openly oppose the Executive branch and consider it illegitimate. The Executive contemptuously disregards Parliament and refuses to recognize its legislative authority. General Dostum and Atta Noor proudly throw insults at each other in the media. Ahmad Zia Massoud refuses to accept Ghani’s directive removing him from his post. Each party is developing parallel links with foreign powers to strengthen their hold on power. First the ongoing disputes between Ghani and Abdullah became an open secret before eventually spilling onto the media. Then the scandal between Dostum and Aeschi reared its head. After Dostum refused to relinquish the post of Deputy-President despite Ghani’s insistence, Ghani tried to form an alliance with Dostum’s archrival – Atta Noor. Noor who belongs to Abdullah and Zia Massoud’s Jameeat party pounced at this opportunity and was willing to risk a public break with Abdullah in exchange for the post of Deputy-President. However when Ghani announced the removal of Zia Massoud from the post of special advisor to the President, the Jameeat cadet once again closed ranks and accused Ghani of abusing his powers. 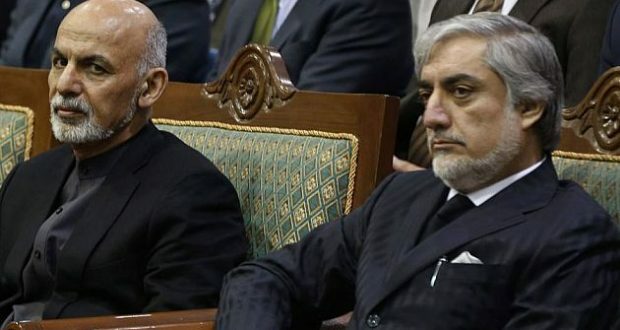 Prior to this debacle the Parliament in Kabul had declared the government of Ghani as illegal yet Ghani continued to ignore the declarations of his Parliament. The tumult of the regime is not limited to individuals but crisscrosses in policy matters as well. Ghani has signed several secret pacts with various governments and refuses to divulge their contents. The Chief Executive openly contradicts official policy be his willingness to recognize the Durrand line as the official border of Afghanistan. The confusion and anarchy governing the regime was best illustrated after the U.S. dropped the ten-ton MOAB bomb in Nangarhar province. While Ghani publicly welcomed this war crime. On the other hand his ambassador to Pakistan and close advisor – Omar Zakhilwal – declared it a crime. Similarly while Abdullah praised this use of over-proportionate power yet his close advisor – Daud Asaas – declared the move as unacceptable. This foreign-serving regime is daily gripped by scandals and the law of the strong prevails in the capital. At a time when the Mujahideen are daily gaining territory the regime is become dangerously close to fragmenting and violently turning on each other. Each strongman is busy building his private army and considers Ghani as a mere figurehead. In such anarchy days are becoming years and one is left to wonder just how long this rotten building starts crumbling on itself.